It may sound a little odd but the folks at OtterBox have decided to make a series of cases which offer even greater protection. Known as the Armor Series, they claim this case to be drop proof, waterproof, dust proof and crush proof. How does it live up to these claims? 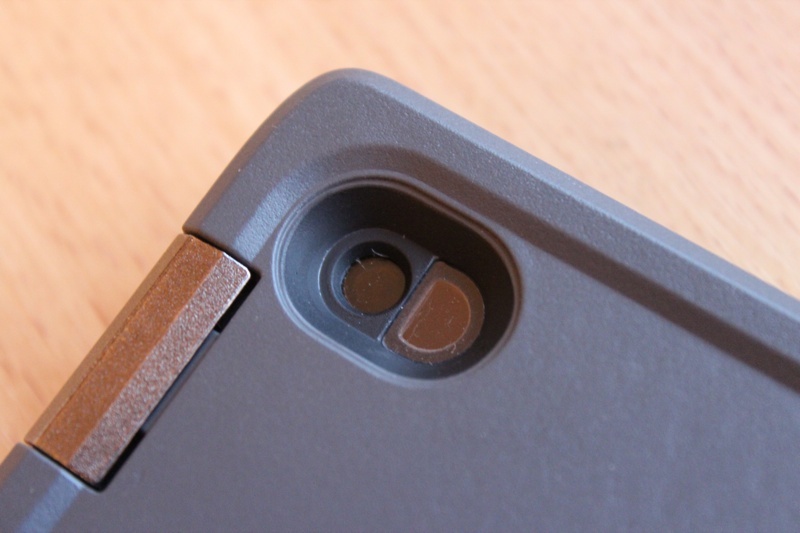 Well we've had our case for the iPhone 4/4S for over three weeks and have put it through it's paces, so keep on reading. Discussing the design and build firstly. This is an area where it's very apparent that this isn't a case for everyone, it's specialist. The hefty bulk and weight are not going to be suitable for someone who keeps their iPhone 4/4S in a pocket most of the day (not to say the case isn't pocketable) and who uses the phone casually, no where near water or serious danger. For someone who simply wants solid protection and a slim, stylish case, we recommend the OtterBox Reflex Series. However the bulky design of the Armor is a consequence of the claimed wide spectrum of protection. It's oddly comfortable to hold and use initially, but the added bulk becomes quickly annoying after around 15 minutes of usage. The corners of the case are rounded off, so that they don't dig into the hands and the silicone sides deliver a decent amount of grip. The black side and grey rear and front coupled with the mild regime of light colours that can either come in lime green, a bright blue or a bright orange that make up the colour schemes, are very distinctive and the smooth sides and lack of irrational design incorporations mean one thing. 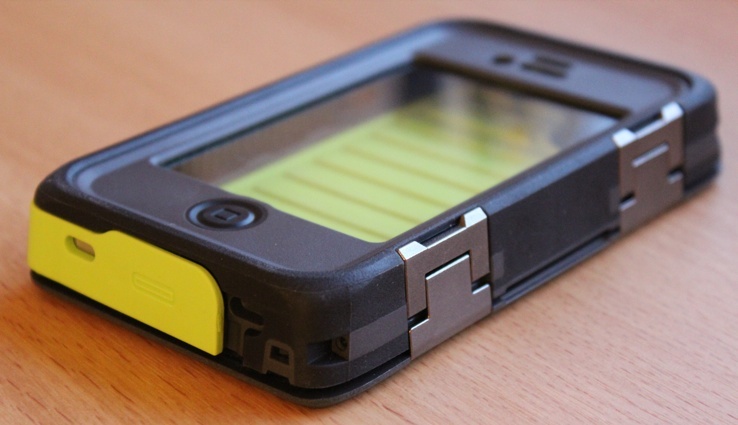 OtterBox have tried to make a really rugged case, stylish. And we commend them for this effort. The materials used to construct the Armor Series Case go far beyond anything OtterBox has previously used. The waterproof thermal plastic shell for starters is very high spec. The two corrosion-resistant stainless steel latches situated on the left hand side of the case are built to 'medical grade' standards. Three layers of protection exist and are all incorporated into one sandwich. These include grooved plastic which run along the interior side walls of the case, this is reinforced via another layer of more plastic and then married to this is a layer of silicone. The detachable rear case piece also has this sandwich structure. Something we did want to touch on was that the LifeProof case offering is the clear competitor to this case and the price difference of $99.99 for the Armor and $79.99 for the LifeProof is interesting. The Armor definitely offers a substantially better build and better value in comparison but the LifeProof is a bit slimmer. However the protection offered from the Armor is overall better. But if we were going to purchase a case within this league, from these two, it would have to be the OtterBox Armor. Opening the case to insert the iPhone is very simple, it's ironically quicker to remove and apply this case than it is the Defender Series. A quick pop of each latch and the rear panel detaches freely from the case. Undoing the latches definitely requires medium-long finger nails though. Once the panel is removed the iPhone can go in. The fit is very snug, the phone will definitely not move around in the slightest. When the iPhone is inserted the rear panel can go back on. The panel is padded with a textured silicone ribbed bed membrane that directly presses itself against the rear of the iPhone and moulds to its shape. 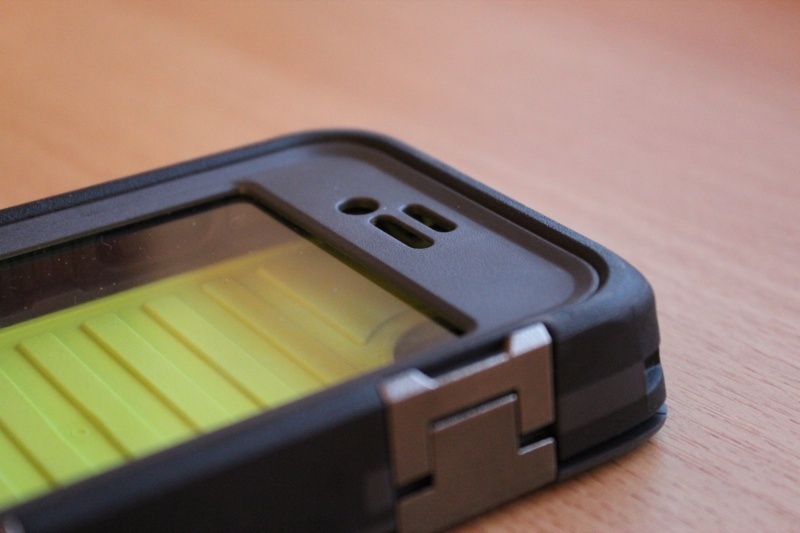 Another element of this case we were more impressed with than that of the LifeProof's was the inbuilt screen protector. It delivers greater clarify and covers up any defective clarity via the delivery of warmer tones shown through it. The iPhone's screen was just as responsive as it would be out of the case. But we didn't like that the case completely covered the bezel, it makes the iPhone not so easy to use on instances. The Armor obviously covers the entire iPhone, however the functionality of the phone is surprisingly un-compromised. The volume buttons, mute/ silent switch, sleep/ wake button and home button are all covered by the cases silicone, but are still accessible because the silicone is moulded over the buttons acting as artificial replicas. The buttons are responsive and easy to locate and use quickly, if a little tighter than the bare buttons and the mute/ silent switch is also very easy to use. The rear camera and LED flash and front camera are cutout and shielded with glass and to our delight the clarity of the camera isn't compromised from the very tiny cutouts. We feel the cutouts seem to allow the exact same amount of light into the lenses as if the phone was bare. The non-permeable membranes also known as silicone flaps, separate the outside environment from the inside of the case bluntly, with the use of patented O-ring seals. The membranes allow full unhindered access of the top auxiliary inputs which is a godsend in comparison to how this function is operated on the LifeProof and also exposes the top microphone when opened too. The 30 pin dock connector is cutout at the bottom, wide enough to insert the Apple charging cable under the membrane. But what really impressed us was that the bottom speaker can be heard without the need of one of these membrane flaps being opened. A mesh layer covers the speaker and is persistent in not letting in any harmful elements whilst allowing solely sound to pass through. Granted the audio output quality is hindered from being covered and at times sounds very muffled, but the level of clarity presented is better than many other waterproof case offerings for the iPhone 4/4S. Phone calls have been pleasant, microphone quality is no doubt slightly reduced though. Moving briskly onto the killer feature and that is the protection. In short the protection is bar none the best we've ever seen presented from a case for the iPhone. Four claims are made of what the protection will resist against and the first is that's it's waterproof. We can confirm that this is indeed true, but wholly unbelievable. 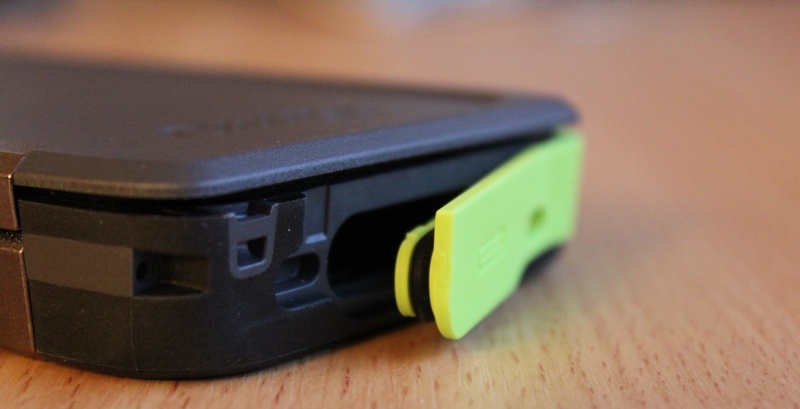 We find it hard to believe because the patented O-ring membrane flaps that cover the 30 pin dock connector and auxiliary input, feel and act essentially like standard OtterBox silicone flaps, but they keep the water out of the case when closed. OtterBox claim the Armor case will tolerate submersion within water for up to 30 minutes in up to 6.6ft of water. The waterproof functionality is very useful, I spend a lot of time near water specifically at the beach and to use a waterproof case that doesn't jeopardise the iPhone's functionality and that also feels and looks like a normal'ish' looking case, is brilliant. The claims of the drop and crush protection are that this case can survive 10ft drops and 2 tons of force. We haven't tested up to these very aggressive specifications but have throttled the Armor, dropping it repeatedly from up to 7ft directly onto solid concrete, then we played a game of catch with the case and dropped it brutally on many occasions, we finished up by driving a car over the case. After all this the iPhone was perfectly intact and scuff free, the case also held up well and only had a couple of scratches and chips after our fun. Of course the final claim OtterBox make is that this is dust proof which is sort of a given if water can't even get in. The level of innovation that has been evidently injected to create this level of protection is staggering, it's a watchful guardian for the iPhone. OtterBox have raised the bar of what's been previously possible to do with ultra protective cases. For someone who works in an industrial field or someone who's in the scenario of needing a somewhat indestructible case. 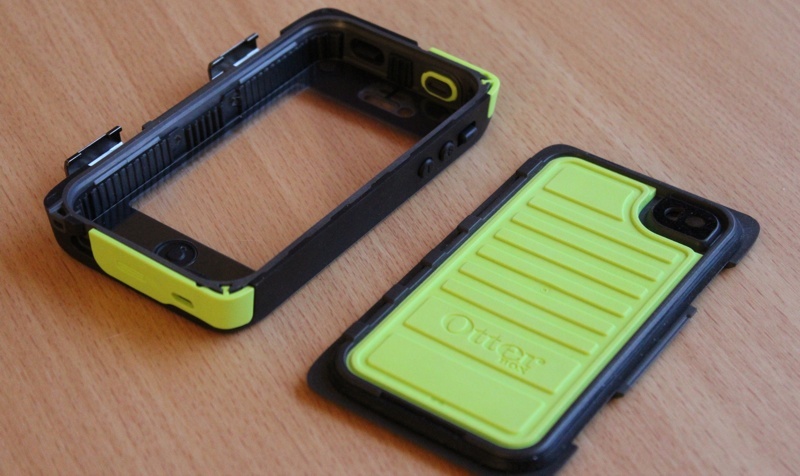 The OtterBox Armor Series for the iPhone 4/4S will tick the requirement checklist very swiftly.